This is the final post in a series (Read Part One, Part Two, Part Three, Part Four, Part Five, Part Six) looking at the non-peer reviewed CARRS-Q publication entitled “Bicycle Helmet Research“, published in 2011 and widely relied upon to support mandatory helmet laws for cyclists. This publication was commissioned by the State Government to support its policy of mandatory helmet laws in Queensland, Australia, in the face of criticisms of its lack of support for Brisbane’s public bike hire scheme. In addition to selective reliance pre-existing analyses of the efficacy of helmet wearing discussed in previous posts, CARRS-Q also sought to conduct its own analysis of data. Data was sourced from police records and hospital data provided by the State Government’s Department of Transport and Main Roads. Data analysis by CARRS-Q was restricted to after helmet laws were introduced, which is of some concern given that the Victorian research discussed in a previous post showed significant anomalies between pre-helmet law injury rates and post-helmet law injury rates that could not be attributed to helmet use. Additionally, the data used probably only represents somewhere between 3.5% to 11% (possibly even lower) of all bicycle crashes, and is likely to only include crashes that occur on roads and only include the most serious injuries. Limiting the data only to a period when helmets were required by law, and only to roads where helmets must be worn, means that any non-helmeted crash victims included in the survey fall into a very specific category: law-breakers. As well as the likelihood that non-helmeted cyclists belong to an age group more likely to have a serious crash, it can also be assumed that any adults riding without a helmet against the law may also be risk takers (the ‘risk’ is a hefty fine – up to $150 in some states in Australia). CARRS-Q also concluded that injury severity was lower for cyclists wearing a helmet. However limiting the analysis only to the very small percentage of the most serious injuries will give a false representation of any association between helmet use and crash severity. Despite CARRS-Q’s claims, what the above graph clearly shows is that there was no clear drop in fatalities at the time helmet laws were introduced, followed by a constant plateau as helmet laws remained constant, which would be the expected result if helmet laws had any effect on injuries and no effect on cycling participation. In fact, what the graph shows is that while there was an initial drop in 1992, the number of cyclist fatalities in 1993 actually exceeded the number of fatalities immediately before the introduction of the helmet laws. Coincidentally, the penalty for not wearing a helmet was introduced in 1993. What follows is an unsteady but gradual decline in fatalities. This graph more appropriately supports the contention that helmet laws have simply continued to reduce the number of cyclists since their introduction. So what does the CARRS-Q analyses of existing data, and all the previous research discussed in previous posts actually prove? The actual conclusions that can be drawn from the above fall significantly short of CARRS-Q’s bold claim. Children and youths are most likely to suffer a cycling related crash that is serious enough, or possibly serious enough, to be reported. Children who do crash are most likely to suffer a minor head laceration that is superficial (i.e. lots of blood, nothing seriously hurt, the type of inury that an adult would have avoided by instinct or experience, for example holding their hands out break their fall). Children, especially teenagers, are also the most likely not to wear a helmet. Children, especially teenagers, are also most likely to give up cycling if helmet wearing is mandatory. Helmet wearing significantly reduces the number of people choosing to cycle across all age groups. Significantly increased numbers of people cycling make cycling safer for those that cycle, however that increased safety is likely to diminish if cycling becomes the most popular form of road transport. The biggest killer of cyclists is motor vehicles, specifically articulated or rigid trucks. Cycling is inherently a safe means of transport. In social economic cost terms, increasing cycling will result in savings across the areas of health, transport infrastructure, pollution and productivity that outweigh any costs that can be associated with cycling-related injury. The possible decreased likelihood of a serious head injury that can be attributed to wearing a helmet, is probably negated by the likelihood of a neck injury. New research by CARRS-Q itself, confirms that teenagers and other cyclists who fail to wear helmets (in jurisdictions where they are required to wear them by law) are much greater risk takers. Any change in the age demographic of riders over a period of time is going to significantly change the injury statistics over that same period of time. Unlike the efficacy of helmets which should be clear between a time when helmets were not mandatory and helmets were mandatory (e.g. 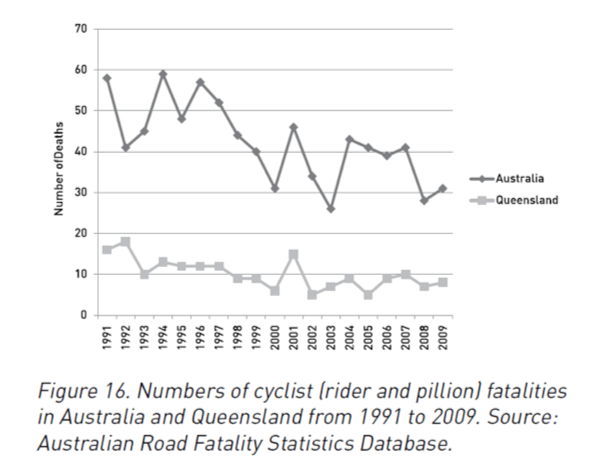 pre- and post-introduction of mandatory helmet laws), changes in the age demographic of cyclists will evoke a gradual change in statistics, such as can be seen in the graph discussed above, entitled Figure 16: ‘Numbers of cyclist (rider and pillion) fatalities in Australia and Queensland from 1991 to 2009’. Secondly, on a community scale, the economic advantages from increased cycling far outweigh the possible disadvantages of reduced helmet use. Fourthly, the lack of real, unequivocal evidence allows political agendas to pick and choose certain findings, so that bad policy decisions can appear to be supported by ‘science’. This concludes our comprehensive assessment of the CARRS-Q document used by the former Queensland Government to boost support for mandatory bicycle helmet laws. This is the sixth post in a series (Read Part One, Part Two, Part Three, Part Four, Part Five) looking at the non-peer reviewed CARRS-Q publication entitled “Bicycle Helmet Research“, published in 2011 and widely relied upon to support mandatory helmet laws for cyclists. This publication was commissioned by the State Government to support its policy of mandatory helmet laws in Queensland, Australia, in the face of criticisms of its lack of support for Brisbane’s public bike hire scheme. The CARRS-Q publication doesn’t address the fact that only two bicycle hire schemes in the world are failing, in Brisbane and Melbourne both where helmet use is mandatory; or that the CEO of one of those schemes admits there’s no doubt mandatory helmet laws are affecting the scheme. 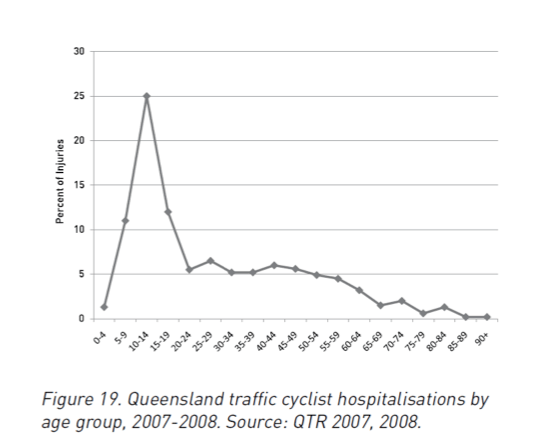 So, after 20 years, the best that CARRS-Q can claim is that “absolute numbers” of cycling rates in South East Queensland now exceed what they were immediately before helmet laws were introduced. The population of South East Queensland before helmet laws were introduced was 2.83 million. It is now 4.51 million, an increase of over 66%. The only conclusion to draw from this 20 year stagnation of absolute cycling numbers is that, around about the time of helmet laws being introduced, something happened that severely curtailed cycling in Australia. What this Melbourne research actually found was that there was a significant decrease in the numbers of children and teenage cyclists as a result of helmet laws. As discussed in a previous post, the Melbourne study also noted a possible increase in adult cyclists but recognised that this was difficult to confirm as the there was 4 years between the two surveys relied upon for ascertaining the number of adult cyclists. The first survey was conducted in 1987/88, about three years before helmet laws were introduced. The CARRS-Q publication also relies on data from Melbourne, Perth and Sydney that shows that cycling rates have increased over the last 5 years. Given that helmet laws were introduced 20 years ago in these cities, and rates have only increased in the last 5 years, it is difficult to draw any correlations between these recent increases and the effect of helmet laws. During the regime of mandatory helmet laws, an entire generation has attained an age historically popular for cycling. Australians under the age of 25 cannot remember a time when helmets were not mandatory. It is extremely dubious to rely on these recent increases as evidence that helmet laws do not affect cycling rates. However this is exactly what the CARRS-Q publication does. Of specific interest is the Sydney report’s findings that mandatory helmet laws discourage 19% of non-cyclists from any type of cycling. In other words, here is research that shows that existing cyclists would ride more often, and non-cyclists would start riding, if helmet laws were repealed. Recent New Zealand research also confirms these findings, finding that regular cyclists ride half as often as they did prior to mandatory helmet laws. CARRS-Q has ignored significant research showing that helmet laws are directly responsible for significant reductions in cycling. This position removes all credibility the CARRS-Q publication has in comparing the social economic benefits of cycling, including health, traffic congestion, pollution and infrastructure, to the possible costs associated with head injuries if mandatory helmet laws were repealed. The last post in this series will look at CARRS-Q’s use of existing police and hospital data and available bicycle fatality data. While CARRS-Q relies on this data to support its stance in favour of mandatory helmet laws, it is clear that the data is unreliable and that CARRS-Q utilises a number of very dubious assumptions to reach its conclusions. Cycling without helmet laws is safe. Fear is unhealthy. Do Economic Benefits from Cycling Outweigh The Head Injuries Prevented By Helmets? This is the fifth post in a series (Read Part One, Part Two, Part Three, Part Four) looking at the non-peer reviewed CARRS-Q publication entitled “Bicycle Helmet Research“, published in 2011 and widely relied upon to support mandatory helmet laws for cyclists. This publication was commissioned by the State Government to support its policy of mandatory helmet laws in Queensland, Australia, in the face of criticisms of its lack of support for Brisbane’s public bike hire scheme. “In monetary terms, it is unlikely that the helmet wearing legislation would have achieved net savings of any sizeable magnitude. Under the assumptions used in the study, the most favourable estimate of the Net Present Value of the bicycle helmet legislation was $2.0 million, and this calculation excluded any costs associated with reduced cycling activity.” (Hendrie et al, Road Accident Prevention Research Unit, Department of Public Health, University of Western Australia: An economic evaluation of the mandatory bicycle helmet legislation in Western Australia, Insurance Commission of Western Australia Conference on Road Safety, 1999). This West Australian study was not mentioned at all in the CARRS-Q publication. Table 1. Estimated impact of cycling per bicycle kilometre travelled (Table 1 from PricewaterhouseCoopers, 2009). As can be seen from the actual figures, the total social economic benefit far outweighs the costs associated with cycling injuries. CARRS-Q believes that the solution is to successfully encourage cycling while retaining helmet laws. This position denies the evidence that helmet laws reduce cycling. It is clear that the CARRS-Q publication fails to take a full account of all the social economic benefits of cycling in its assessment. It is also clear that CARRS-Q took an extremely conservative view of the proven health benefits of cycling, choosing to compare this to an overestimation of possible costs associated with cyclists’ head injuries. In this respect, the CARRS-Q publication fails to provide a proper, unbiased costs analysis of mandatory helmet laws. The next post in this series will look at CARRS-Q’s claims that mandatory helmet laws do not discourage cycling. This position is fundamental to CARRS-Q’s claims about cyclists’ head injury rates (which CARRS-Q denies could be primarily caused by fewer cyclists), and CARRS-Q’s dismissal of the likelihood of significant social economic gains from increased cycling if the helmet laws were repealed.